The next upcoming Rath Yatra is on Thursday July 4th, 2019. 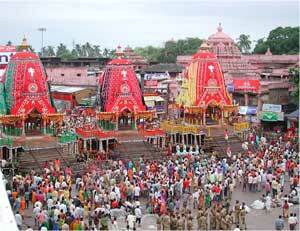 Rath Yatra is a Hindu festival held each year in mid-summer. Also known as the Chariot Festival, it is one of the largest religious festivals in India. The three deities, Jagannath, Subhadra, and Balabhadra are celebrated. The morning of the festival begins with a ceremony and in the afternoon the exciting chariot ride takes place. These three deities are symbolized via idols as Lord Jagannath and his sister (Subhadra) and brother (Balabhadra) traveling in chariots called raths from his temple in Puri to the countryside.